Farewell to One Of The Most Versatile Stamps! Back when I ran my new catalog retiring stamps prediction contest, I had people guessing that the Delightful Decorations stamp set would retire. I thought, “No Way!” This stamp set has been great for more than just Christmas so I figured that for sure it was saying. So, today is a walk down memory lane of some of my favorite cards using this stamp set. First up, a recent card that we made at my Fabric Technique class. I die-cut out 4 flowers using the Floral Framelits and folded them together to make this cute flower. But every flower needs a vase and the ornament stamp/punch with the bottom point trimmed off works just perfect! 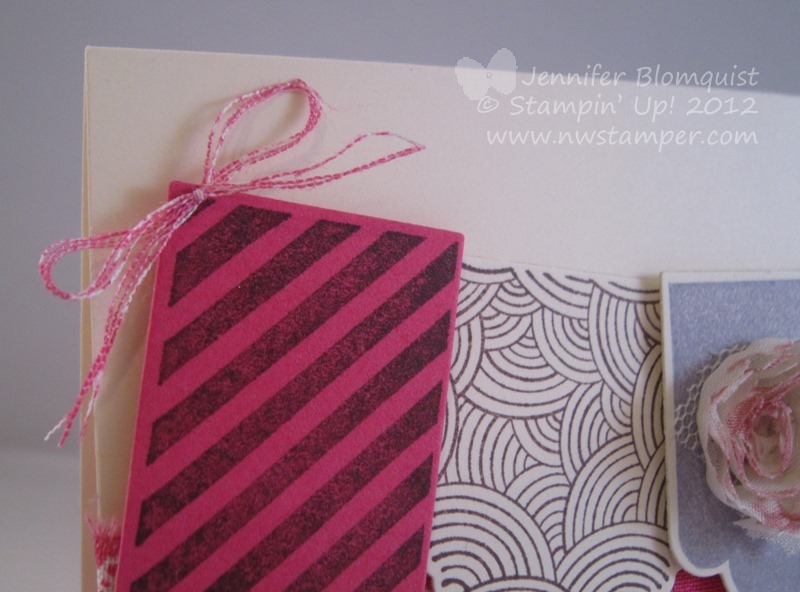 The stamp set also contains that cool dotted circle that I used for my background. 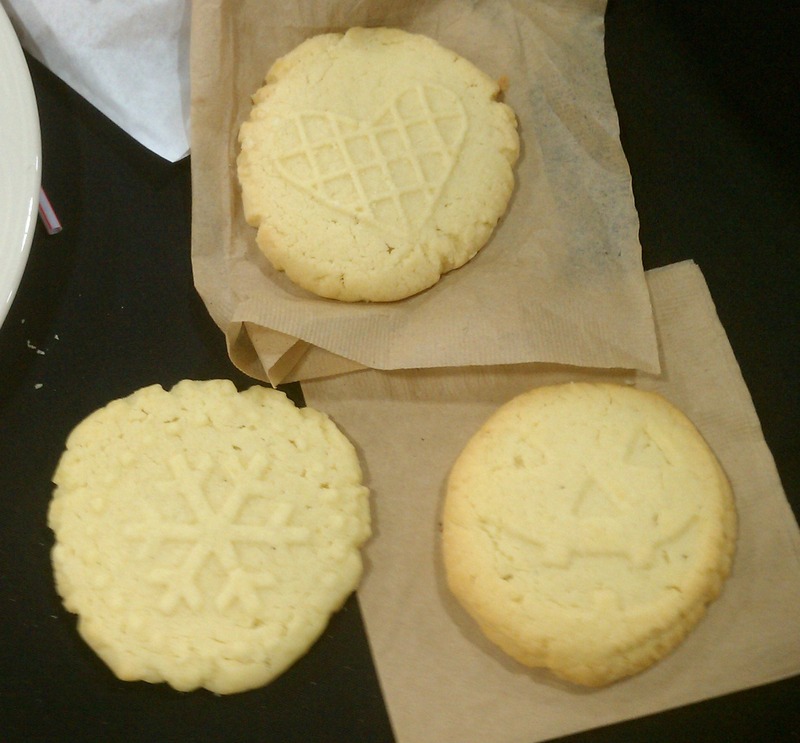 See…totally doesn’t have to be Christmas. Next up… how about a fish? I love how you can turn the punch on its side and make it be a cute punch art fish. If you are curious which punches I used for this card and how I put it together, you can check out the blog post here – Fish Punch Art. Of course, just because I don’t have to use it for Christmas, of course it is perfect for Christmas tags and cards too. This simple card was one of my favorites from my holiday collection. I hope you enjoyed my stroll down memory lane….I think I’m off to give my set some love. And if you don’t have this set yet, make sure you pick it up by tomorrow before its gone! Shop the retirement lists online here. 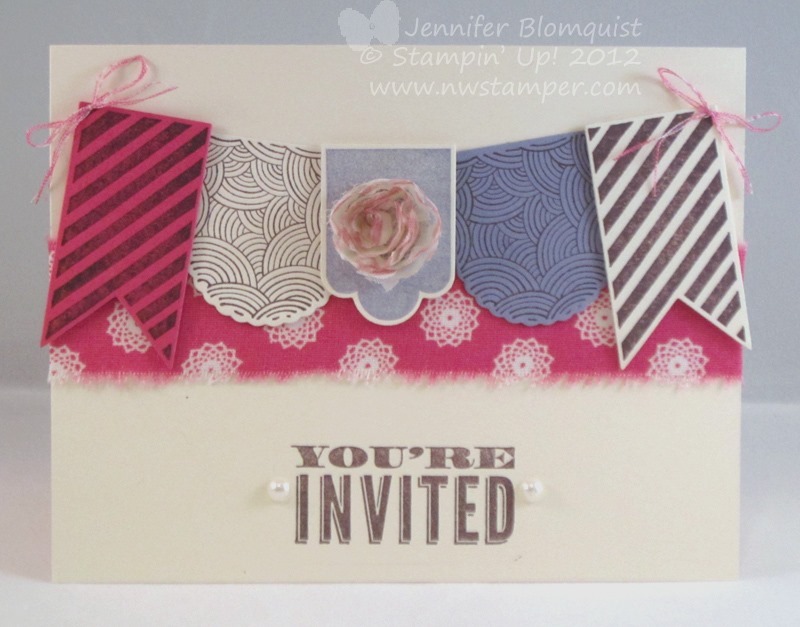 If you want an idea for a fun handmade invitation – whether a shower invitation or birthday party invitation, check out today’s post as I play with cute colors and fabulous fabric as part of this month’s Stylin’ Stampin’ Squad blog hop. 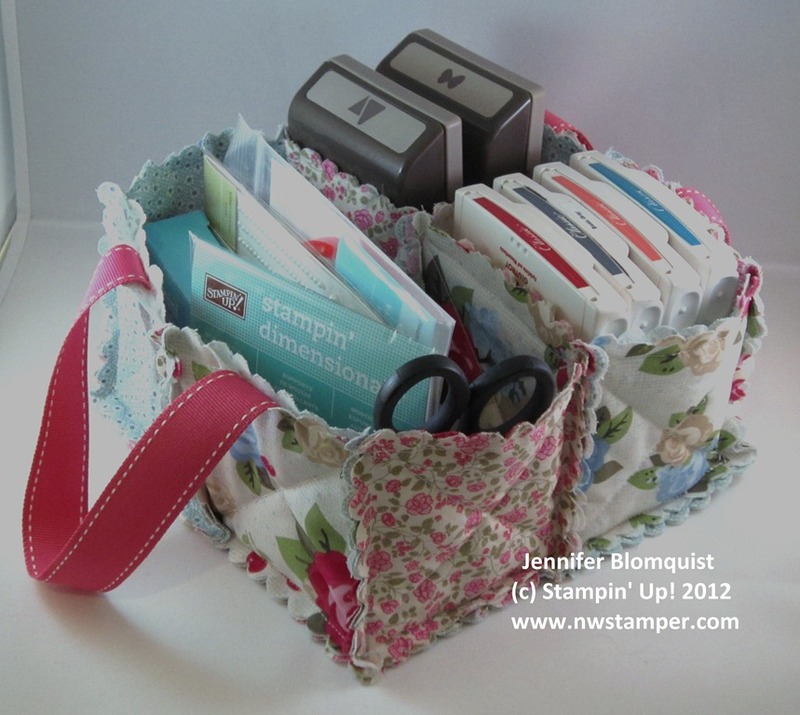 You’ve seen the cute fabric patterns out there and love the idea of using fabric in your crafting projects… but if you are like me, that often means piles of fat quarters languishing in a drawer or on a shelf. I’m serious, I have a tall stack of fabric in my drawer behind my craft table! You may be thinking, “that is it?” And I’ll tell you – Yep! See, the cool thing is it took me just a few seconds to rip a strip of my fabric but that rip gave me an awesome fringe that adds just a bit of texture to the card, not to mention the fibers of the fabric. Anyway, in real life I really liked the contrast of the Melon Mambo in the fabric with the Melon Mambo in the cardstock on the banner. I also mixed and matched the height and colors of the banner pieces – all elements from the Hearts a Flutter stamp set and coordinating framelits. Then a final touch with one of the flowers from the Flower Trim that has been sponged with a Sponge Dauber to have pink edges. Finally, my last cool touch – the bows on the banner! Why are these bows cool? Because they totally match! Did you notice? They are made from the extra threads that came off when I ripped the fabric strip. So, it was an easy way to effortlessly have matching “twine” to go with your project. 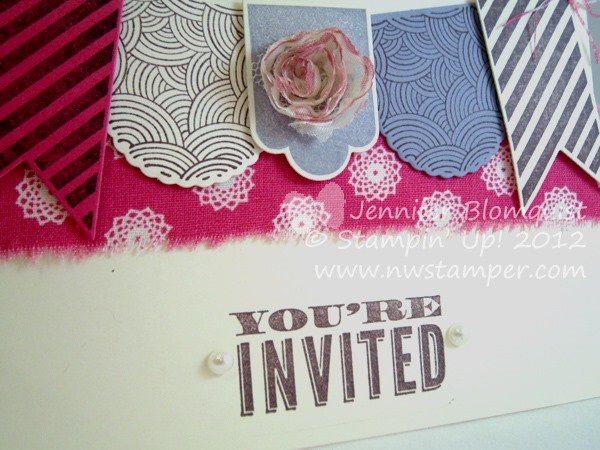 When I finished and needed a sentiment, I was just drawn to the “You’re Invited” stamp from the Oh Hello stamp set. So, I’ve decided this is a great invitation whether for a birthday, wedding shower, or baby shower… or I guess whatever else you could imagine! Does anyone else see “party” too? Now, if you want even more ideas for how to use fabric in your crafting projects, hop on by to the next stop on tour and be ready for some FAB ideas! Jennifer B of NW Stamper <– You Are Here! Isn’t it super awesome?! I have it sitting by my craft table all the time. 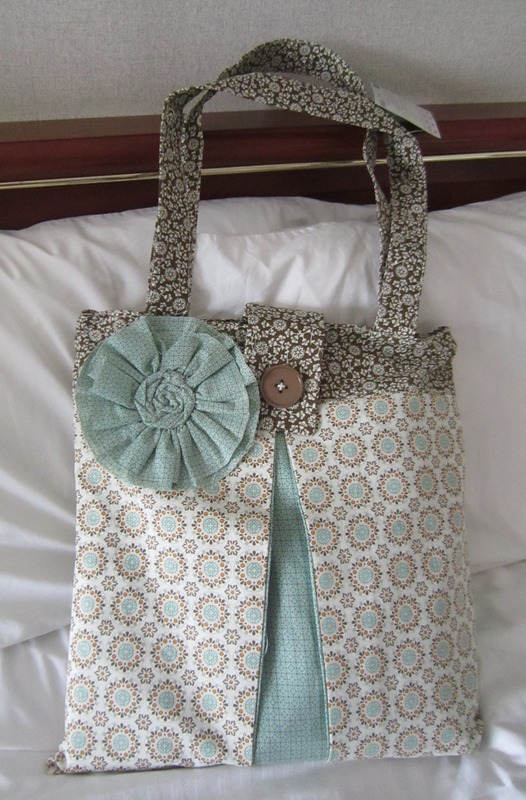 Though what I love about it is that I feel like even the sewing newbie like me could make this! See, the trick to me is cutting lots of squares out of the fabric using the Scallop Square Bigz die. It gives you consistent sized pieces for your projects, its easy, and did you know you can run multiple layers of fabric through in one pass through your Big Shot? Wha-Bam!! Talk about speedy cutting for your sewing project, right? Anyway, the caddy is 2 squares long on each side with a divider down the middle. Then divide one half again to give you the three compartments. Does that make any sense? I think, this took 22 Scallop Squares (one on the outside and one on the inside for each square you see). She also stitched in some of the retired – so sad – stitched 5/8” Rose Red grosgrain ribbon. Wanna see it again from another angle? Oooh… Pretty! Now just think for a minute how expensive these totes are in the stores… now imagine how much money you save when you buy this fabric from the clearance rack for only $0.99 for 3 extra-large fat quarters. Um, yeah, you would probably save enough to buy some goodies to stuff your bag with. hee hee… or maybe that is what I would do. 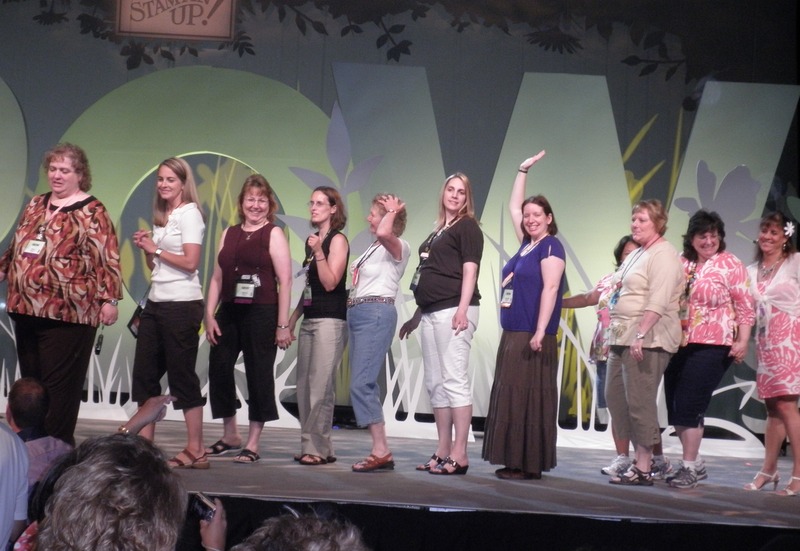 PS – Did you know, that if you decided to sign up with Stampin’ Up! as a demonstrator this month, not only would you get the $125 worth of product for $99, plus the free Halloween project kit, but you would also receive 20% off your order of fabric. So, those $0.99 fabric sets just got knocked down to about $0.79! Just saying! Don’t Miss Designer Fabric on Clearance–only $0.99! If you are a fan of my Facebook page, you’ve already seen me post about this special clearance sale, but just in case you missed it… you still have time! While Supplies Last! Get any one of these sets of designer fabric for only 99 cents! 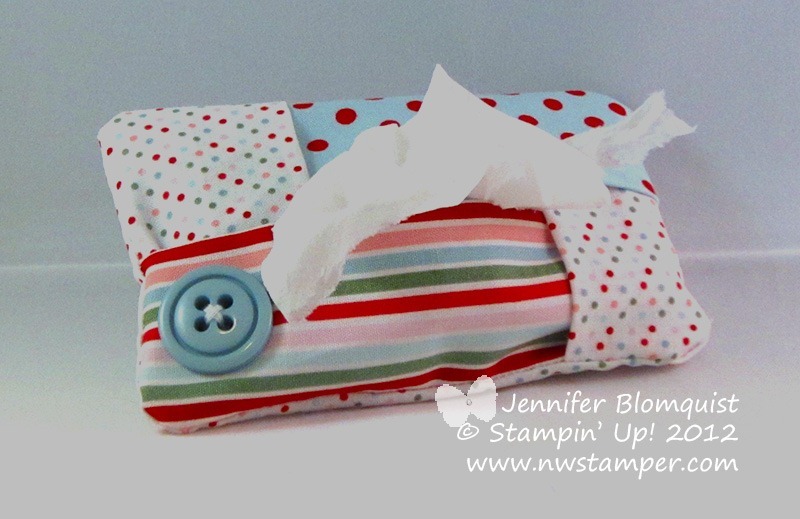 Each package contains 3 patterns and each piece is an extra wide fat quarter (27” x 18”). They are great to make cute projects and work awesomely with your favorite Big Shot dies! So, snag them up while you can! Shop online or contact me at jennifer@nwstamper.com to place your order before they are all gone. I thought today I would share something different then my usual card/paper craft project, plus it is a great example of what you can use with some of the fun 60% off items in the Stampin’ Up! Clearance Rack! 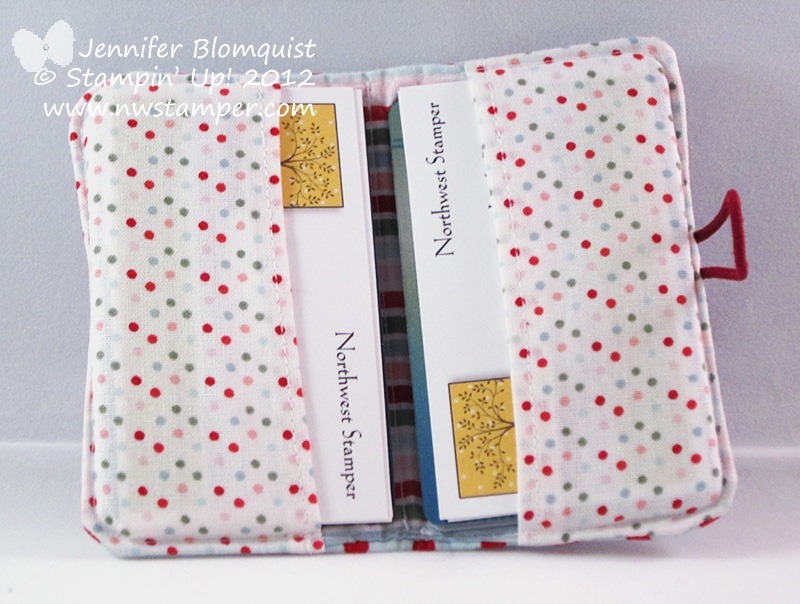 This is a cool little project that my friend Annie Lee made for me that I use every single day! This was made as a business card holder but I started using it as my credit card wallet and I love it! 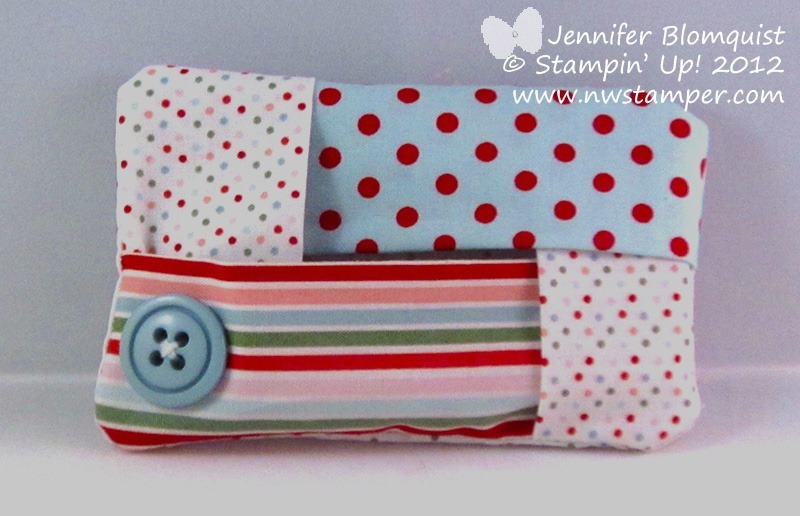 So, this used some of last year’s Candy Cane Christmas fabric and the Big Designer Buttons. She sewed two pieces of fabric together for the cover (so there is cute striped fabric on the inside and polka dot fabric on the outside). The clever part is she took a hair rubber band and stitched it between those two layers on one side to be used as the “clasp”. There is also a line of stitching half way between the two short edges to hold the fabric together and make a clean fold for the wallet to fold in half around. 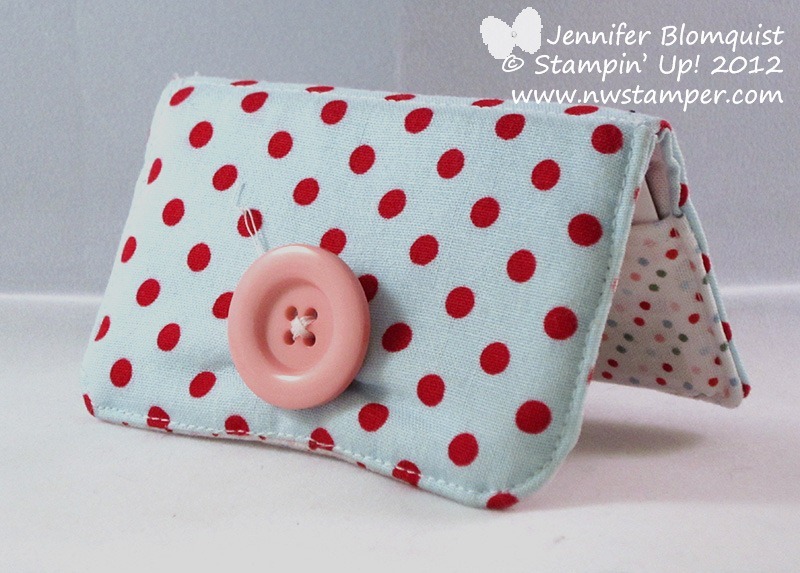 Finally, she added another polka dot fabric piece to each side to make the pockets. Add a button to the front and it works awesome! Having a diaper bag with me all the time, it is nice to be able to have a small wallet for my credit cards that I can put in the pocket and not have it take up too much space in my overstuffed bag. 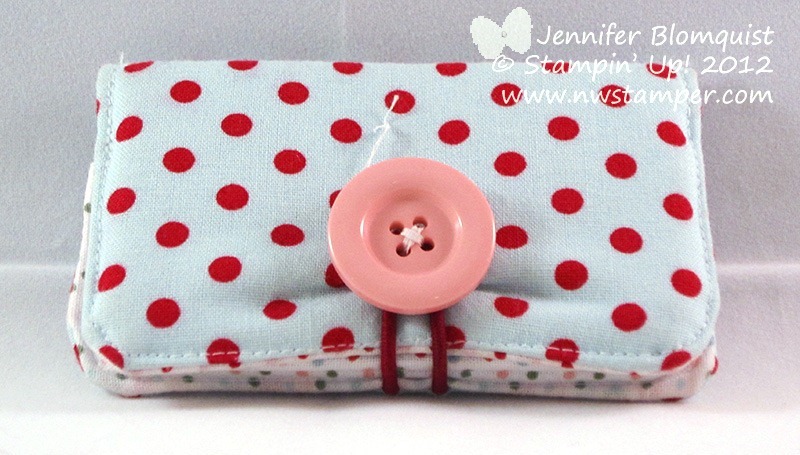 If you want to make your own, there is still some retired fabric and a few colors of these designer buttons in the Clearance Rack for a great deal!! The retired fabric is only $3.99 and the buttons are only $3.59! Didn’t I tell you it is an awesome deal? That is 60% off! Well, hope you have a great Friday…. and only 4 days until I’m off to the Stampin’ Up! convention! 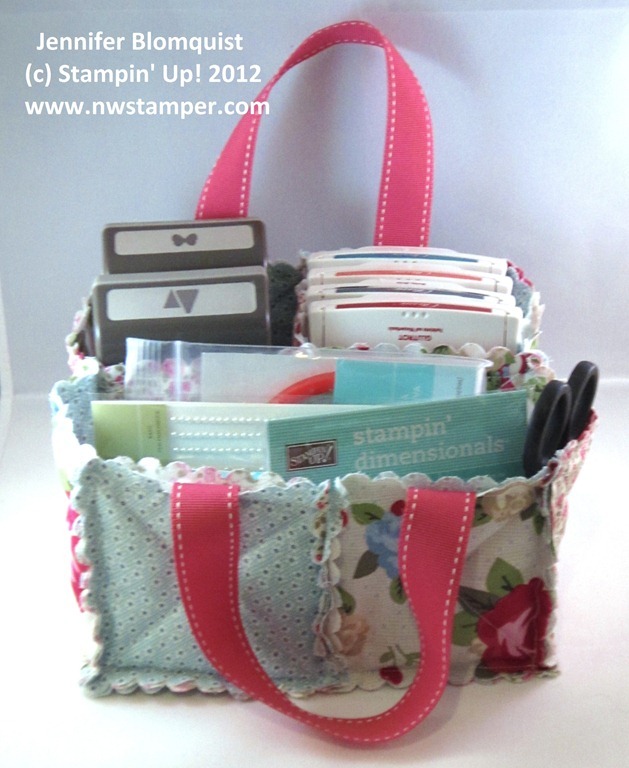 I do, however, have a great demo friend name Annie Lee who loves sewing and when I was getting ready for the Northwest Women’s Show, offered to take some of my Stampin’ Up! designer fabric and make some project samples with it. I mean, seriously, who wouldn’t feel a bit cheered up with these bright and fun colors when you are feeling under the weather? So, a huge THANK YOU to Annie for showing me some super fun ideas for when I get over my fear of the sewing machine and try it out myself. My word! Its been a whirlwind of a week starting with me desperately trying to get swaps made and everything packed and ready to go for convention this year. 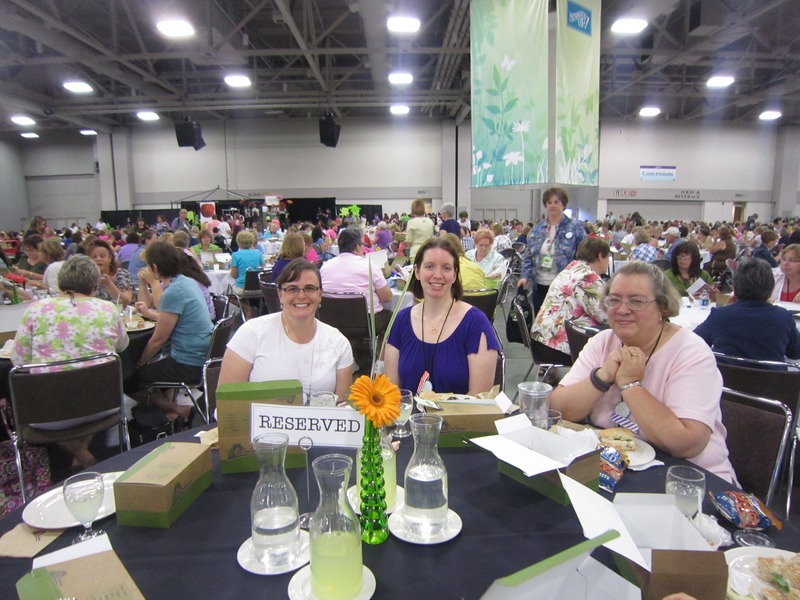 But I made it and flew into Salt Lake City on Tuesday in anticipation of a great week…and I haven’t been disappointed! Today was the first day of convention and boy was it a doozy! Lots of sneak peeks of upcoming products, freebies, amazing ideas, and fab projects. I’ve been posting pictures on my facebook page when I could so if you want to see a few more pictures, check it out. But I couldn’t take pictures of a lot of the details I learned so I wanted to share a few pictures and more details! Enjoy! Ok, can I have a personal toot for a minute? :) Each year they invite people who met certain milestones or achievements to walk across the stage. I am still working towards that, but this year they added 2 more marches – first time attendees and anyone who recruited in the last year. Well, Bethani, my downline, got to walk for first time attendee and I got to walk for recruiting! Yay! Know what it’s for? AAAAHHHHH! I’m so excited!!! It’s made to fit the new Simply Scored tool! That’s right, a super awesome scoring tool. It takes the best features of what’s out there and adds some, like besides giving you lines every 1/8”, you get a metal tipped ergo stylus, multiple plastic arrows to mark which score lines you are using for a given project, a storage compartment, multiple ruled edges, etc. I’m so stoked! Ok, moving on. At lunch, I had another amazing experience where when we entered the Gathering Place to get our lunches, we got picked for a You Crew experience. You Crew is their name for randomly selecting people to have one of a variety of one of a kind experiences and in our case, we got a special table with glasses, plates, lemonade, a staffer who made sure we were well taken care of. Pretty fun! Finally we finished our day with make & takes, which I still need to finish so I can share with you, and one more session where we saw some great ideas for quick, easy, and inexpensive projects. Like did you know you can get a package of quick accent stickers, 2 packages of notecards, and make 40 cards in no time flat? And they are simple and cute too. I know I don’t have many project sample pictures today, but don’t worry. I’ll have more of the projects and products I can photograph and share posting over the next few days. And don’t forget to stop by my facebook page to see more photos and updates when I can.